The content of today’s post literally changed as I was about to start writing. As regular followers will know I am in the middle of the immigration process in the USA and this morning another step on that journey was completed. Authorisation to start working arrived and so after 5 months it’s time to apply for a job. With the work authorisation came a document allowing me to travel home to Ireland in case of any emergencies while my application for full permanent residencey is completed later this year. 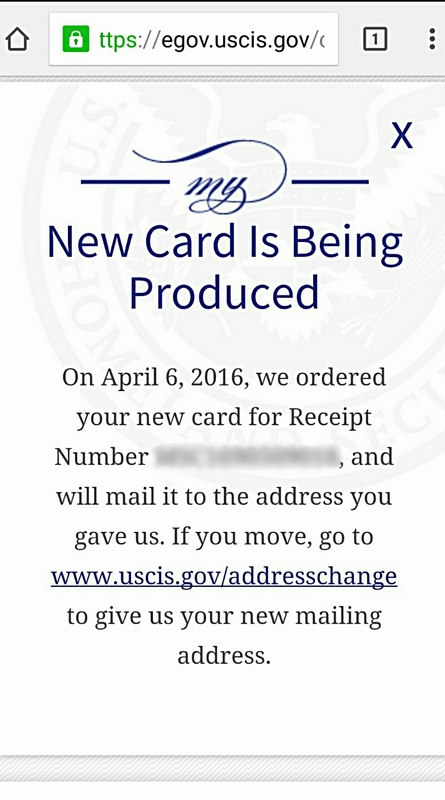 This is a huge step and it comes nearly exactly 1 year after we first started the K1 visa process. The visa journey isn’t for those lacking patience and we have been extremely lucky as we both support each other through the various stages. Anyway back to what today’s post was supposed to be about. Last night my wife had arranged a surprise night out for herself and me. I had no idea where we were off to as we set off at 6.30pn yesterday evening. Even as we got the train into Atlanta and got off at the Philips Arena station did I know what was happening. 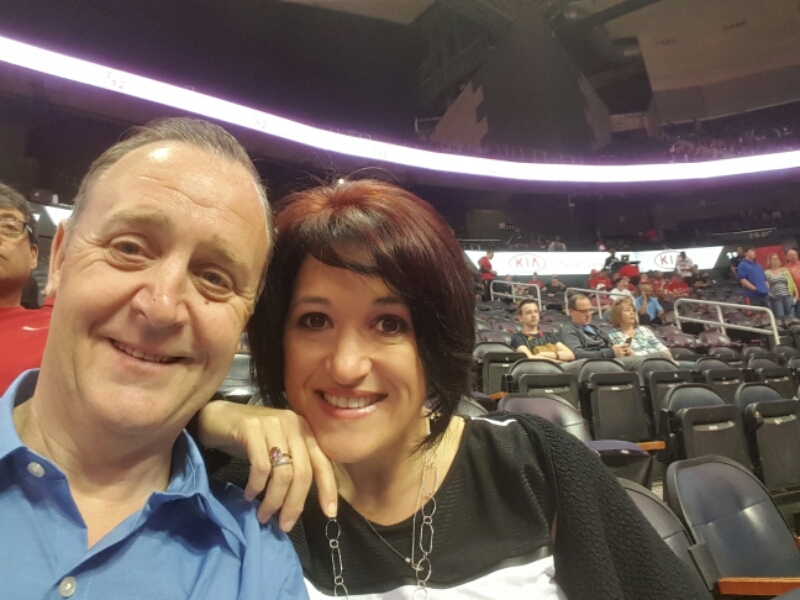 It was only as we walked into the Arena and Leanne produced two tickets see the Atlanta Hawks NBA did I realize we were going to a basketball match. I have only seen one basketball game in my life and that was in 2000 when I went to see the Boston Celtics while over on a trip for St. Patrick’s Day. I had totally forgotten about that game until I was reminded this morning. But last night was my first proper experience of a basketball game as we were seated about 6 rows from the court and we able to have a beer and food in our seats while enjoying the game. 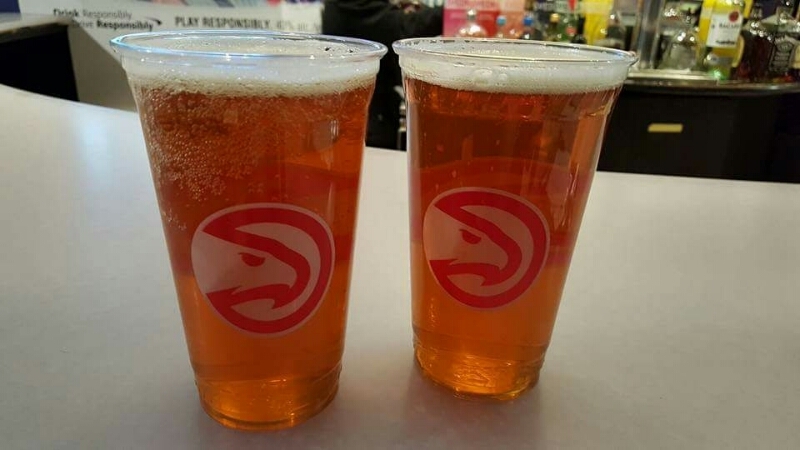 Just a quick note on those beers and food, I am well used to being overcharged at events in Ireland, but I have to give the concession stands in the Philips Arena the gold medal for overcharging. $9 for a beer and $10 for a few chicken tenders is a bit steep to say the least. I would hate to see how much a t-shirt or a cap was. But it was a special night so we had a few beers and a bite to eat. 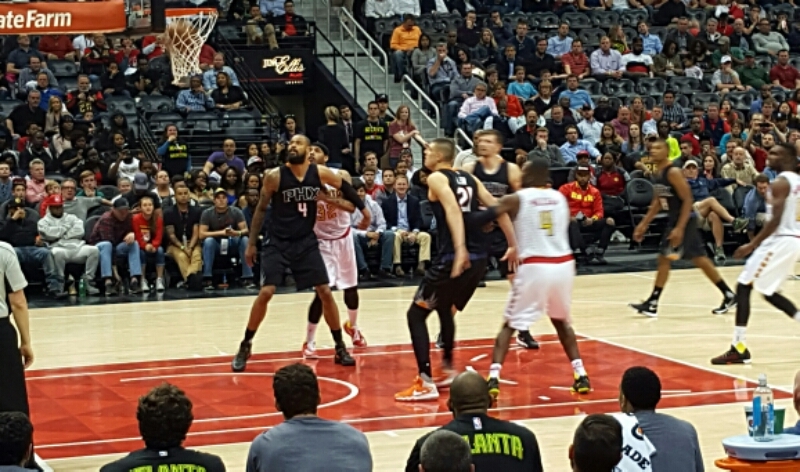 Onto the game itself, it was fun with the Hawks coming back from a 14 point deficit to win by 13 with a brilliant second half. I had to keep asking Leanne some rules as I know the basics but that’s about all. The while staging of the game is professional and good. With pregame entertainment involves cheerleaders and music and the music continues all the way through the game. We even had some soccer style chanting from a group of fans close to us. As the game wore on and the Hawks were staging their comeback the crowd really got behind them, the $9 beers starting to take effect I think. As a surprise night out it was an excellent choice. One thing I haven’t mentioned yet is that last night was the first time since I arrived here last November that I have heard the US National anthem sung live. Like all national anthems it was great to see it respected and some day in my future it will be my anthem alongside my Irish one. 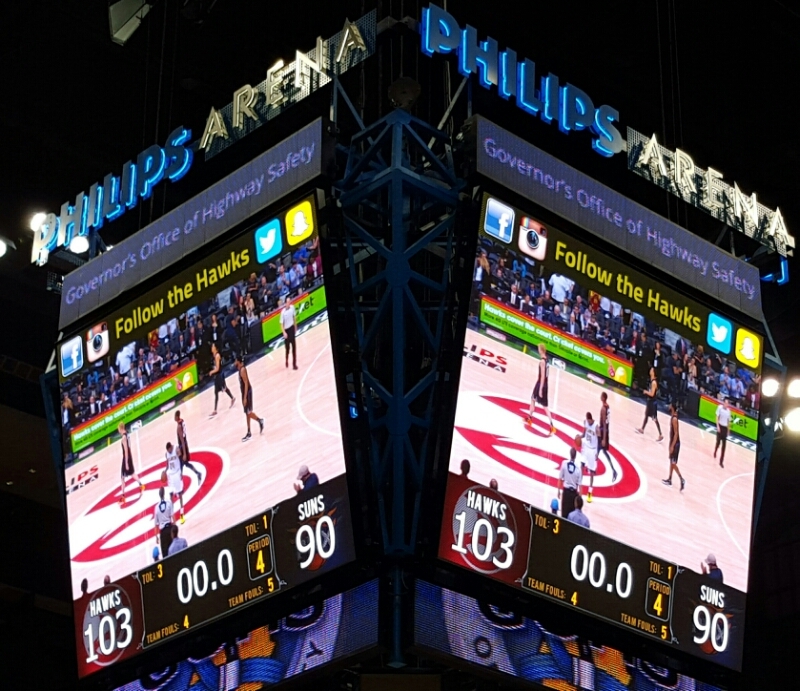 So a lovely evening ended with the Hawks winning and a trip home via MARTA, the rail system for Metro Atlanta. I love MARTA, and it’s a lot like the DART back home but more efficient and covers a much larger area. 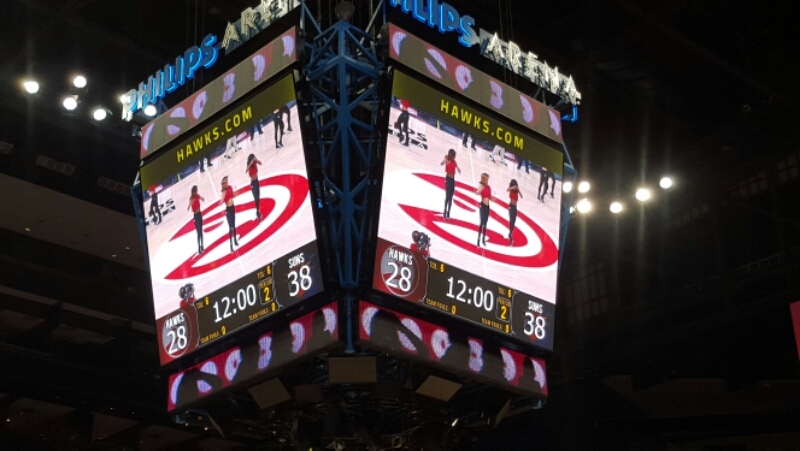 The Philips Arena emptied and people were on trains in a few minutes. Looking forward to my next visit to a American sporting event, Baseball, NFL, College Football or soccer, I am sure it will be equally as good as last night.